Hands down, Arkansas is one of the worst states for poker players. Unlike surrounding states where you might be able to play in your local casino or participate in home games, that’s not the case in Arkansas. Unless you want to risk fines and felonies, of course. Although that sums up the rest of this page, you can continue reading on to learn what specific laws make it illegal to play poker in Arkansas. Section 5-66-112. Card games -- Betting. If a person bets any money or any valuable thing on any game of brag, bluff, poker, seven-up, three-up, twenty-one, vingt-et-un, thirteen cards, the odd trick, forty-five, whist, or at any other game of cards known by any name now known to the law or with any other or new name or without any name, upon conviction he or she is guilty of a violation and shall be fined in any sum not less than ten dollars ($10.00) nor more than twenty-five dollars ($25.00). Do Casinos in Arkansas Offer Poker? Poker can be found (via machine) at the Oaklawn Jockey Club and the Southland Greyhound Park. In 2008, Oaklawn started a new $3 million construction project that included adding slot machines, poker tables and new racing complex. This addition would (will) make them the largest gaming location in the state of Arkansas. We receive a lot of questions about Arkansas poker laws. I thought it'd be helpful to post those here along with my answers for everyone to read. 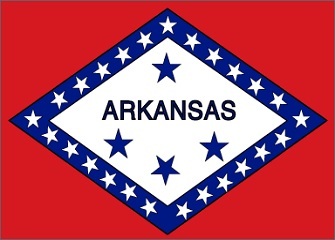 Will online poker be regulated in Arkansas? Probably not. No laws have been proposed and the state doesn't enough interested parties to push a bill forward. Arkansas has also made news by cracking down on internet sweepstakes cafes. Officials have shut down companies that were running sweepstake-style promotions where casino games and prizes have been involved. It’s not that efforts haven’t been made, though. Nancy Todd, a pro poker player, attempted to persuade the state of Arkansas to build 4 Poker Palace casinos by generating over 70,000 signatures. These casinos would’ve focused primarily on poker. Unfortunately, Nancy Todd’s efforts were crushed in late 2012 due to improper language on the bill. What other forms of regulated gambling is legal in Arkansas? Where can I read more about Arkansas poker laws? Here are some fun facts about Arkansas poker and gambling. The State Racing Commission, which controls the horse and dog racing laws, controls the gambling jurisdiction. Poker legend Thomas Austin Preston aka Amarillo Slim was born in Arkansas 1928. Preston won the 1972 World Series of Poker (WSOP) Main Event and was inducted into the Poker Hall of Fame in 1992. Hot Springs used to be a very popular gambling spot similar to a small Las Vegas in the late 1800s. This died down after the second World War.